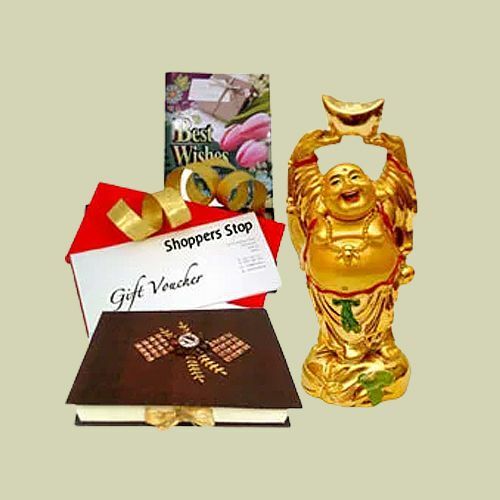 Tether your loved ones to your heart by sending this Smashing Gift Pack of Shoppers Stop Vouchers, Laughing Buddha, Homemade Chocolates N a Free Best Wishes Card and surprise them with your special gesture. This Hamper consists of Shoppers Stop Gift Voucher worth Rs. 500, Feng Shui Laughing Buddha, 12 Pc. Assorted Homemade Chocolates pack (265 gr.) and Best Wishes Message Card. Flowers Delivery Jhansi, Send sweets Haridwar, Wedding Cake Yamunanagar, Diwali Mithai Panchkula, Send Flowers and Gifts to Bilaspur, Online Shop Thrissur, Flower to Vellore, New Year Flowers Buldhana , Fresh Fruits Kapurthala, Send Gift Tanjore, Dry Fruits to Roorkee, Birthday Delivery Nellore, Sending to Guwahati, Flower shop Amravati, Shimla Online Cake Delivery.